Troy (Turkish: Truva or Troya) is an ancient city in what is now northwestern Turkey, made famous in Homer’s epic poem, the Iliad. According to Iliad, this is where the legendary Trojan War took place. Today it is an archaeological site popular with travellers from all over the world, and in addition to being a Turkish national park, it is on the World Heritage List of UNESCO. Situated on Hisarlık Hill on the northwestern tip of Troad Peninsula, the site allows total control of Dardanelles, which, along with the Sea of Marmara and the Bosphorus, is today known as the Turkish Straits. In many periods of history, this was a key route connecting Mediterranean with the Black Sea, as well as being where European and Asian landmasses are almost just a stone's throw away from each other. Hisarlık Hill has hosted major human settlements almost continuously since 3000 BC. The earliest city on the site was a small Neolithic settlement of which little remains. A successor to this settlement, now referred to Troy II, was also of modest size but built monumental buildings and amassed such astonishing treasure that early archaeologists initially associated it with a much later period. More famous, however, are the Late Bronze Age Troy VI and Troy VII archaeological layers, likely corresponding to the city known to the Hittites as Wilusa and possibly corresponding to the city known in later legends as Troy. The abduction of Queen Helen of Sparta by Paris, a Trojan prince, sparked emnity between the Trojans and Achaeans from across the Aegean Sea, or so says the story. 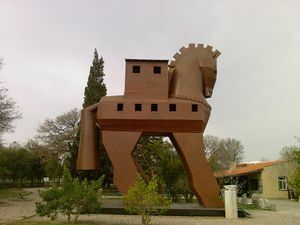 Having been unable to break into the defensive walls of the city for nine years, Achaeans decided to set up a trick—they offered a huge wooden horse as a gift to Trojans, as an amend for the bother they caused with their war galleys on the city's beach. Trojans accepted the offer sincerely, but this resulted in them losing their city, as inside of the horse was full of Achaean soldiers, ready to combat, and now right in the centre of the city. Researchers still debate not only whether there was a Trojan War but also what it would mean to claim that there was a Trojan War. However, it is settled beyond a doubt that the site on Hisarlık Hill was the city which was regarded as the site of a Trojan War in later time. (For instance, numerous coins turn up in the topsoil at the site identifying it as such.) Moreover, we know from Hittite records that the city of Wilusa was involved in several military conflicts which also involved Greek people between the 15th and 12th centuries BC. (We can't be sure *how* these events involved the various parties-- it seems like some Greek people may have fought alongside the Trojans against the Hittites during one of these conflicts, and a later conflict may not have reached the city proper.) Thus, if the identification of Wilusa with Hisarlık Hill is correct, the site would have hosted events which could well have inspired the later myths. Troy VII was largely abandoned at the end of the Bronze Age. However, after a few centuries, Greek colonists arrived and built a city known now as Troy VIII but at the time called Ilion. Residents of this city were very aware of the role their home played in mythology, going so far as worshipping parts of its ruins (though also demolishing other parts). This city was sacked during a rebellion against the Byzantines and subsequently rebuilt as Ilium, known archaeologically as Troy IX. Troy IX was abandoned as the Trojan bay silted up, nullifying its reason for existence. It eventually disappeared under laters of dirt in the late middle ages. In antiquity, the Trojan War widely regarded as a historical event, but this view became less popular as the years rolled by. In 1868, Heinrich Schliemann, a German businessman and a self-proclaimed archaeologist, sought to prove that Troy was a real place, taking the hint that it might be buried under the Hisarlık Hill from Frank Calvert, a British archaeologist who visited the site three years earlier. As Schliemann's excavations were totally amateurish, it damaged the integrity of much of the remains, but Schliemann obtained what he yearned for anyway—his Greek spouse Sophia Schliemann is immortalized in a photo showing her wearing the treasures found at the Hisarlık Hill (part of the treasure was later taken by the Red Army from Berlin to Moscow at the end of World War II). Although almost a century and a half passed since the days of Schliemann, Troy still hasn't been unearthed completely yet, and the excavation works still continue to this day. Once a harbour city on the edge of a deep bay of Dardanelles, the site now lies 5 km inland from the coast due to the alluvial material carried by the River Scamander (modern Karamenderes), which filled the bay, turning it into the fertile, flat farmland stretching out to the sea that it is. In modern Turkish, there is a tendency of shifting of the name of the site from Truva, which reflects the pronounciation of French name of the place (Troie) as that was the language of choice among the Turkish elites up to 1950s, to Troya, which is closer to the original Greek name, although both can still be heard interchangably. The nearest main center is Çanakkale, about 30 km to the north of Troy. There are minibuses that travel to and from the Çanakkale local bus station, which is located under the white bridge by the river,near the local bus station. The trip takes ~45 minutes. From Çanakkale, the minibuses are scheduled (as of 2016/09) to leave every hour starting at 7AM with the last one at 3PM. To get back, they leave hourly starting at 9:30AM with the last one leaving at 5:30PM. An up to date schedule can be found in the Tourist Information office in Çanakkale near the ferry port.Be prepeared that bus don't back every hour if there is no much tourist ,and ask people in Park to comunicate with bus if he don't appear ,or go to first local station in village Troy to Chanakkale .It is about 500 m from Park of Troya . The site is 2 km off the Çanakkale-Izmir highway (D550/E87). Road signs (saying either Truva, Troya, Troy, or Troia, sometimes two of them on the same signpost) will direct you, starting from the ferry harbour in Çanakkale. The path through the ruins is well marked, but quite rocky and slippery in places. Be sure to wear proper walking shoes. Troy was destroyed and rebuilt nine times over, and each of nine different layers still has something left to this day, although amateurish archaeological excavations of late 1800s damaged some of them a lot more than others. The layer that is thought to be depicted in Homer's Iliad is likely Troy VI or VII, a portion of the legendary walls of which is still intact. The admission fee to the site is 25 TL pp (October 2016). Make sure that you don't accept any of the 'old' Turkish money as change from the admission office. You wont be able to use it outside of Troy (for some reason certain locations still accept and distribute the old 'New Turkish Lira') and you will have to change it at a bank. Climbing up the ladders of (fake, re-constructed) Trojan horse in the entrance of the site is an inevitable part of Troy experience. Better do it on weekdays as the ladders (and the interior of the horse itself) may be crowded at weekends by schoolchildren on a schooltrip (a situation which makes climbing up and down those steep stairs rather unpleasent). Winter is a fantastic time to visit Troy, as there are very few tourists around and you may even get the fake horse to yourself. Staying in Çanakkale and visiting Troy as a day-trip is also possible. There are public payphones just off the entrance of the ancient city. Telephone code for the area is (+90) 286. Fans of Iliad (as well as nature lovers) will likely find nearby Mount Ida (to the southeast of Troy) interesting, where gods watched the epic fight below on the fields of Troad, as well as where Paris picked the most beautiful one of three goddesses. Both the northern (through the town of Bayramiç) and southern (from various villages lining the northern coast of the Gulf of Edremit) approaches to the mountain are worth checking. Bozcaada, or ancient Tenedos, an island in the Aegean Sea with a nicely preserved old town and a Venetian castle, is located nearby (within the sight of bare eyes from Troy). Geyikli harbour, which has a ferry connection with Bozcaada, is only ten or so kilometres away from Troy, to the south. Çanakkale, the hub and the main city of the Troad Peninsula, should be one of your next destinations if you have not already arrived from that direction. You can also keep moving southwards via backcountry roads along the coast, passing pleasant villages and a number of ancient Greek ruins among some pretty nice Mediterranean landscapes. This page was last edited on 13 August 2018, at 19:34.